Pier55, Inc./ Heatherwick StudioPier 55 will be a public park and performance space on Manhattan’s lower west side. Media mogul Barry Diller and his wife, fashion designer Diane von Furstenberg, have committed to funding a floating publicpark and performance space on a pier in the Hudson River. Their pledge of over $US113 million will be the single largest private donation to a public park in New York City history, according to Capital New York. 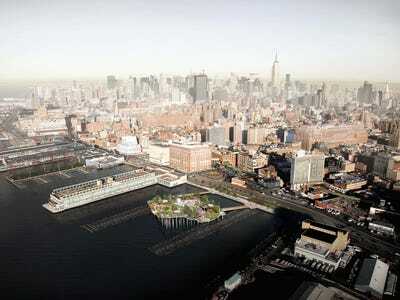 The new addition to the waterfront will be called Pier 55 and is expected to cost over $US130 million in total. The City of New York will provide $US17 million to the project while New York State will provide a separate $US18 million for the construction of a public esplanade that will lead into the pier. 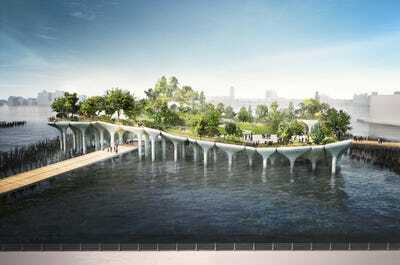 Pier55, Inc./ Heatherwick StudioThe billionaire couple has partnered with the Hudson River Park Trust to build the 2.7-acre square-shaped pier and community art space to replace the deteriorating Pier 54. 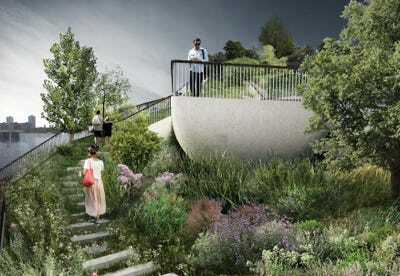 The park will be built on top of a platform 186 feet off the Hudson River shoreline, which will be supported by 300 mushroom-shaped concrete columns, according to theNew York Times. The new space will be built above the flood plain required post-Hurricane Sandy. Pier55, Inc./ Heatherwick StudioIt will sit atop 300 concrete columns. The addition to New York’s waterfront will also have lush gardens, wandering paths, and a700-seat amphitheater that will host art events and performances. “New York has always reminded me of Venice, so I am happy the time has come to properly honour its waterways,” Diane von Furstenberg said in a press release. Pier55, Inc./ Heatherwick StudioPier55 will be open the same hours as the rest of Hudson River Park. Diller and von Furstenberg’s family foundation created a nonprofit called Pier55, Inc. to maintain the park and commission arts programming for it. To oversee the park’s performance venues, they have recruited Oscar-winning producer Scott Rudin, playwright George C. Wolfe, producer Stephen Daldry, and Kate Horton. 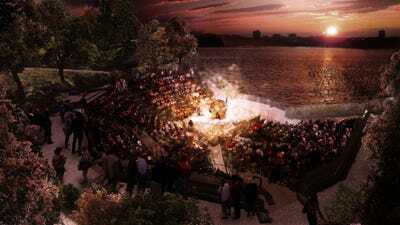 Pier55, Inc./ Heatherwick StudioThe open-air amphitheater will have really spectacular views. The new pier was designed byHeatherwick Studio, the same company who designed the Olympic Cauldron for the London 2012 Olympic Games, in collaboration with landscape architect Signe Nielsen. Pier55, Inc./ Heatherwick StudioThere will be plenty of lush greenery to explore. Construction for the new pier will begin in 2016 and include the demolition of Pier 54, which once served as the departure point for the Lusitana and was the planned arrival site of the Titanic. “Pier55’s imaginative, almost dreamlike design and artistic ambition will touch everyone who visits. This park will be an invaluable public asset for our city for generations to come,” Margaret Newman, executive director of the Municipal Art Society, said in the press release. 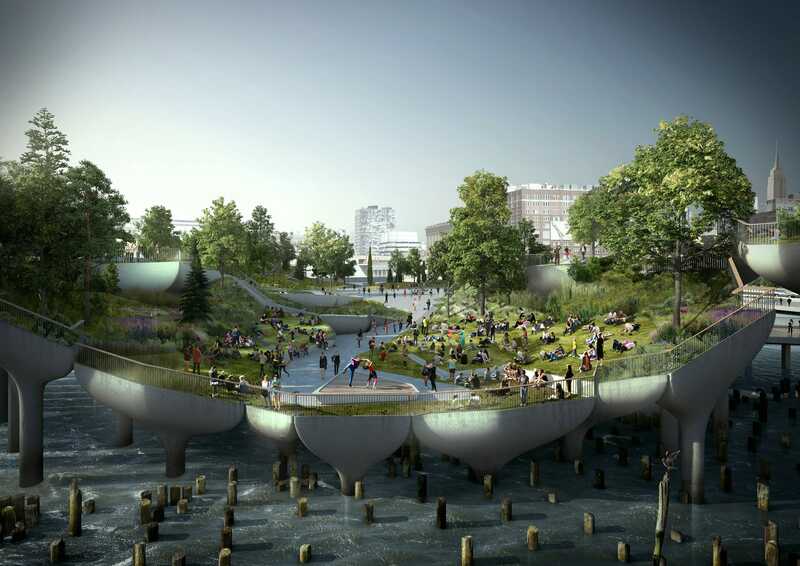 Pier55, Inc./ Heatherwick StudioConstruction for the park will begin next year.